Cloudius on Only One May Stand! hkhssweiss Thanks for your compliments and inputs. Am glad you like the deck. It is a rather complex deck to pilot and even as the creator of the deck, I find the the myriad of decisions to make and the endless combinations of mana to float, mind boggling. I'm currently running 15 Tutor spells and Conflux , at , may be a bit too clunky to use. This deck is build to function without Ramos in play. In fact, majority of the games I won with this deck, didn't see Ramos hit the battlefield even once! 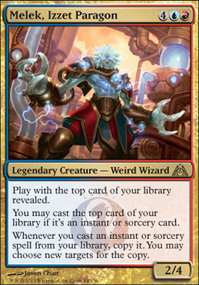 My personal take is that Conflux would be more suitable in a deck that focuses on putting +1/+1 counters on Ramos en-route to victory and isn't running as many tutors as I do. Any of the Wincon cards if I'm searching for the finisher. Let me know what you think and keep the suggestions flowing pal! Cheers. Hey, with so many Islands consider High Tide ? If playing High Tide you also want more cards that can untap lands Frantic Search , Turnabout , Snap . 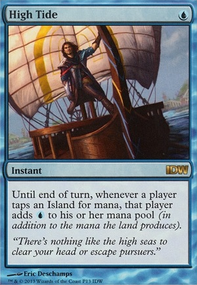 These cards are not just good with High Tide, but are good to get more experience counters faster since they're instants which untap lands letting you play other instants/sorceries in a turn. Mystic Remora : great repeatable draw in multiplayer Commander. 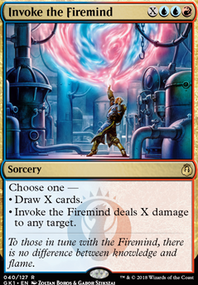 Rhystic Study : great repeatable draw in multiplayer Commander. Spell Burst : counterspell with buyback. Capsize : bounce permanent spell with buyback. Reiterate : copy spell with buyback. Rahnun Early Harvest works in my deck cause I'm trying to win via casting a huge Hurricane and OTKO all opponents. You can consider running it if you've a huge mana sink for all the extra mana generated. 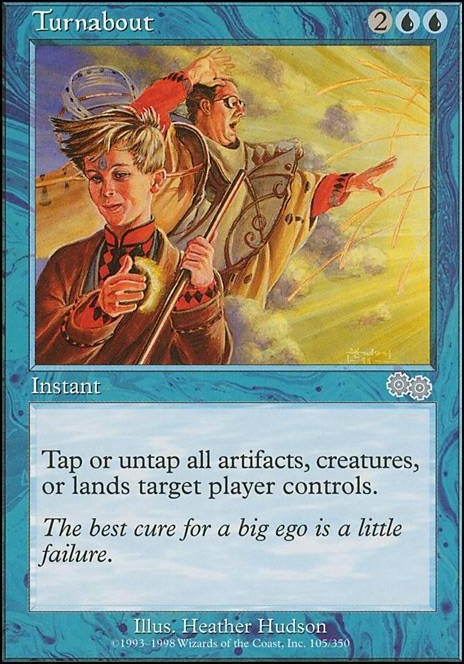 Else, I'd say Turnabout and Rude Awakening would suffice, with the latter acting as an alternate Win Condition by turning all your lands into creatures and turning them sideways for a game winning Alpha Strike. 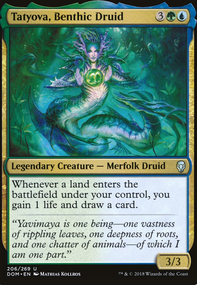 Ability to play at least 3 lands per turn through a combination of these cards - Azusa, Lost but Seeking , Exploration , Oracle of Mul Daya , Wayward Swordtooth , etc. Crucible of Worlds or Ramunap Excavator in play. With the above, we can cast and buyback Walk the Aeons . In the extra turn, play the 3 Islands from graveyard, rinse and repeat and take infinite turns. This combo ain't easy to assemble and is more suited for casual play but you're already running most of the combo pieces so thought I share with you another line of victory. Found this through your reddit thread. Your deck description doesn't really fit what it is that you seem to be doing with the deck. You say you want to combo out quick, which is fine you do you. BUT, if thats the case why are you playing Expropriate ? Or Part the Waterveil ? They're not bad cards but they don't contribute to attempting to storm out and kill with a Grapeshot . Speaking of Ignite Memories tends to be a more consistent Storm kill at lower storm counts I have found since each copy can deal more than 1 damage per copy. Storm lists need access to two things to storm out, plenty of cards that draw cards and make more mana. You have a good start here with cards like High Tide and Turnabout . Next step would be stuff like Doubling Cube for your storm turn, but otherwise I think you're good there. My Biggest general suggestion is that you need more than two wincons. The two that I notice are your Grapeshot and Laboratory Maniac . I like Maniac, I used him once too, and I would still advise Ignite Memories over Grapeshot . Psychosis Crawler is a good way to win games too just by drawing most your deck you win without having to cast a storm spell. Talrand, Sky Summoner and Young Pyromancer give you a way to still come back at someone if you fizzle. Mind's Desire makes it near impossible to fizzle though. Granted my list is years old, I left the game for a while after I made it, but There may be some ideas you could snag from my old Mizzix storm build. It was pretty consistent T4-6 kill. In this scenario you cannot get Turnabout twice. The original Regrowth is on the stack targeting your Turnabout , and whatever copies your spell creates a copy of Regrowth on the stack on top of your original spell. During the resolution of the effect copying Regrowth , you will have to select a target. Since the copy is on the top of the stack, it will resolve first. Assuming you also targeted Turnabout , the copy will return it to you. Before the original Regrowth resolves, you may cast Turnabout and it will go to the graveyard upon resolving. However, whenever an object changes zones, it becomes a new object with no history of its past. It will not be the same Turnabout that was targeted by your original Regrowth , therefore your spell will not resolve due to having illegal target.